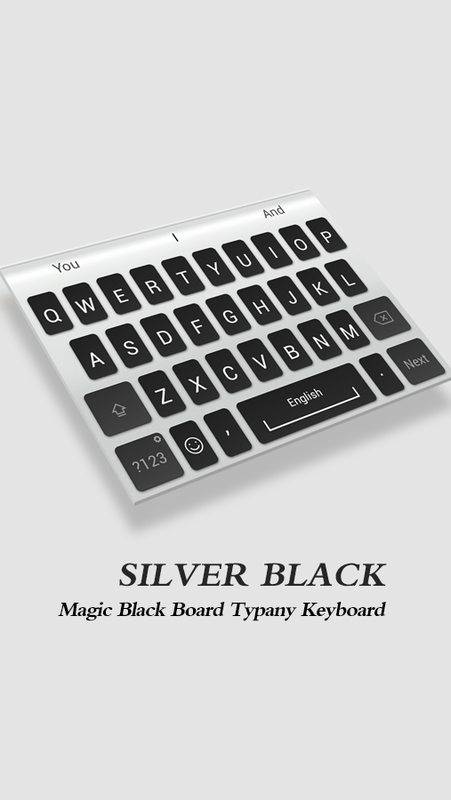 The FREE Silver Black Mac Typany Keyboardthemewill bring a new look to your keyboard. The theme is only available for phones with TypanyKeyboardinstalled! Clickherehreftodownload Typany Keyboard for FREE! -Install the Silver Black Mac Keyboard theme ---> Press itsicon---> It would be enabled by Typany Keyboardautomatically! -The keyboard theme will lead you to Google Play of TypanyKeyboardif you still don't have it in phone. Install and activatetheTypany Keyboard to apply the theme! Typany Keyboard strives tomakeyour typing super easy and fun. Typany Keyboard is a free smart keyboard app forAndroidphones. Click heretodownload Typany Keyboard for FREE! Rate us ★★★★★ if you like our theme. ★ Notice ★ The Ice Cream Labkeyboard theme is specially designed for Typany Keyboard users.Massive stylish themes in Typany keyboard. Update weekly.Lightweight and totally FREE. Click here to download TypanyKeyboard for FREE! Typany Keyboard strives to make your typing fastand fun. ★ How to apply the theme ★ 1. Download and install the IceCream Lab theme 2. Install and activate Typany keyboard The themewill be applied automatically. ★ About Typany Keyboard ★ TypanyKeyboard delivers best next word prediction, kills hassled typosand makes every tap fast and fun. 42 Languages supported. More arecoming soon. Typany Keyboard Features ► SMALL Only 9M, themost compact file size in the industry. ► SPEEDY MixedLanguage Input without switching. ► SMART -The next-generationword prediction and correction engine by Typany Learning. -Learn upto date slangs, phrases and nicknames. -Brackets auto completion ►STYLISH -Embrace a growing number of exclusive themes, emoji, textface(●─●)and stickers. -Design your own photo keyboard ★ Contact Us★ Theme request is now available for Typany fans. Just contact usvia ↓↓↓ Facebook: http://www.facebook.com/typany/ Feedback:[email protected] Google+: http://goo.gl/r9kR12 Click heretodownload Typany Keyboard for FREE! Rate us ★★★★★ if you like our theme.★ Notice ★The Hi Metal keyboardtheme is specially designed for Typany Keyboard users. Massivestylish themes in Typany keyboard. Update weekly. Lightweight andtotally FREE. Click here to download Typany Keyboard for FREE!Typany Keyboard strives to make your typing fast and fun. ★ How toapply the theme ★1. Download and install the Hi Metal theme2.Install and activate Typany keyboardThe theme will be appliedautomatically.★ About Typany Keyboard ★Typany Keyboard deliversbest next word prediction, kills hassled typos and makes every tapfast and fun.42 Languages supported. More are coming soon. TypanyKeyboard Features► SMALLOnly 9M, the most compact file size inthe industry.► SPEEDYMixed Language Input withoutswitching.► SMART-The next-generation word prediction andcorrection engine by Typany Learning.-Learn up to date slangs,phrases and nicknames.-Brackets auto completion► STYLISH-Embrace agrowing number of exclusive themes, emoji, text face(●─●)andstickers.-Design your own photo keyboard ★ Contact Us ★Themerequest is now available for Typany fans. Just contact us via↓↓↓Facebook: http://www.facebook.com/typany/Feedback:[email protected]+: http://goo.gl/r9kR12Click heretodownload Typany Keyboard for FREE! 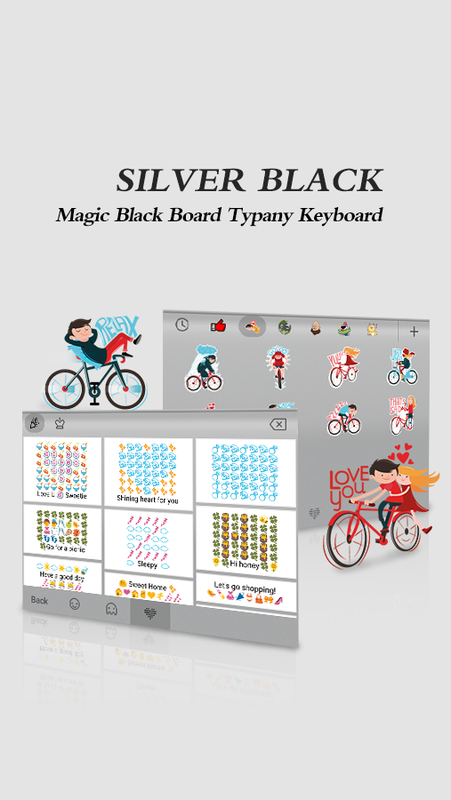 The FREE Silver White Typany Keyboard theme will bring a new lookto your keyboard. ★ Notice ★ The theme is only available for phoneswith Typany Keyboard installed! Clickherehref to download TypanyKeyboard for FREE! ★ How to use? ★ -Install the Silver WhiteKeyboard theme ---> Press its icon ---> It would be enabledby Typany Keyboard automatically! -The keyboard theme will lead youto Google Play of Typany Keyboard if you still don't have it inphone. Install and activate the Typany Keyboard to apply the theme!Typany Keyboard strives to make your typing super easy and fun. ★About Typany Keyboard ★ Typany Keyboard is a free smart keyboardapp for Android phones. ★Typany Keyboard Features★ - Auto-synclatest popular words and phrases for accurate prediction - 100+wonderful themes & skins to customize your keyboard; and morecolorful ones to come - Vivid emoji & emoticons, stickerscompatible across popular apps like Facebook, Messenger, Line,Instagram and more - Emoji predictions - keyboard understands andlearns your favorite emoji - Customized keyboard layout that suitsyou the best - Intelligent auto-correction that feels so natural -Wide range of stickers tailored to diverse cultural regions - Mixedmulti-language input - Brackets auto-completion ★ Contact Us ★Facebook: http://www.facebook.com/typany/ Feedback:[email protected] Click here to download Typany Keyboard forFREE! Rate us ★★★★★ if you like our theme. ★ Notice ★ The Golden Glitterkeyboard theme is specially designed for Typany Keyboard users.Massive stylish themes in Typany keyboard. Update weekly.Lightweight and totally FREE. Click here to download TypanyKeyboard for FREE! Typany Keyboard strives to make your typing fastand fun. ★ How to apply the theme ★ 1. Download and install theGolden Glitter theme 2. Install and activate Typany keyboard Thetheme will be applied automatically. ★ About Typany Keyboard ★Typany Keyboard delivers best next word prediction, kills hassledtypos and makes every tap fast and fun. 42 Languages supported.More are coming soon. Typany Keyboard Features ► SMALL Only 9M, themost compact file size in the industry. ► SPEEDY Mixed LanguageInput without switching. ► SMART -The next-generation wordprediction and correction engine by Typany Learning. -Learn up todate slangs, phrases and nicknames. 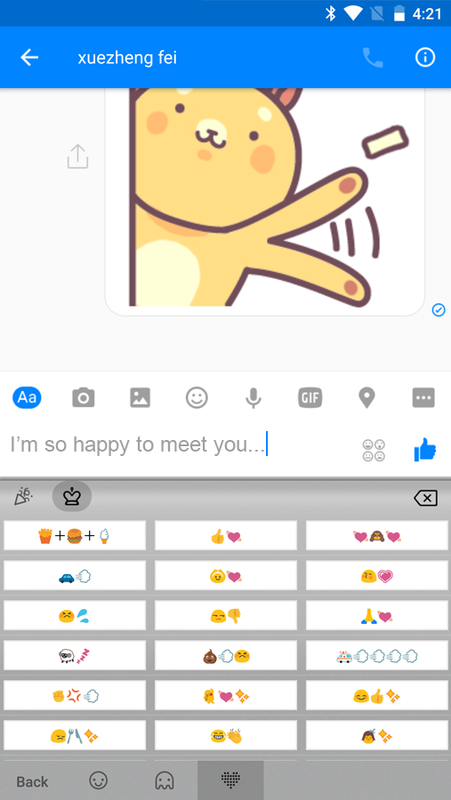 -Brackets auto completion ►STYLISH -Embrace a growing number of exclusive themes, emoji, textface(●─●)and stickers. -Design your own photo keyboard ★ Contact Us★ Theme request is now available for Typany fans. Just contact usvia ↓↓↓ Facebook: http://www.facebook.com/typany/ Feedback:[email protected] Google+: http://goo.gl/r9kR12 Click heretodownload Typany Keyboard for FREE! The FREE Rainbow Light Typany Keyboard theme will bring a new lookto your keyboard. ★ Notice ★ The theme is only available for phoneswith Typany Keyboard installed! Clickherehref to download TypanyKeyboard for FREE! ★ How to use? ★ -Install the Rainbow LightKeyboard theme ---> Press its icon ---> It would be enabledby Typany Keyboard automatically! -The keyboard theme will lead youto Google Play of Typany Keyboard if you still don't have it inphone. Install and activate the Typany Keyboard to apply the theme!Typany Keyboard strives to make your typing super easy and fun. ★About Typany Keyboard ★ Typany Keyboard is a free smart keyboardapp for Android phones. ★Typany Keyboard Features★ - Auto-synclatest popular words and phrases for accurate prediction - 100+wonderful themes & skins to customize your keyboard; and morecolorful ones to come - Vivid emoji & emoticons, stickerscompatible across popular apps like Facebook, Messenger, Line,Instagram and more - Emoji predictions - keyboard understands andlearns your favorite emoji - Customized keyboard layout that suitsyou the best - Intelligent auto-correction that feels so natural -Wide range of stickers tailored to diverse cultural regions - Mixedmulti-language input - Brackets auto-completion ★ Contact Us ★Facebook: http://www.facebook.com/typany/ Feedback:[email protected] Click here to download Typany Keyboard forFREE! The FREE Water Drop Typany Keyboard theme will bring a new look toyour keyboard. ★ Notice ★ The theme is only available for phoneswith Typany Keyboard installed! Clickherehref to download TypanyKeyboard for FREE! ★ How to use? ★ -Install the Water Drop Keyboardtheme ---> Press its icon ---> It would be enabled by TypanyKeyboard automatically! -The keyboard theme will lead you to GooglePlay of Typany Keyboard if you still don't have it in phone.Install and activate the Typany Keyboard to apply the theme! TypanyKeyboard strives to make your typing super easy and fun. ★ AboutTypany Keyboard ★ Typany Keyboard is a free smart keyboard app forAndroid phones. ★Typany Keyboard Features★ - Auto-sync latestpopular words and phrases for accurate prediction - 100+ wonderfulthemes & skins to customize your keyboard; and more colorfulones to come - Vivid emoji & emoticons, stickers compatibleacross popular apps like Facebook, Messenger, Line, Instagram andmore - Emoji predictions - keyboard understands and learns yourfavorite emoji - Customized keyboard layout that suits you the best- Intelligent auto-correction that feels so natural - Wide range ofstickers tailored to diverse cultural regions - Mixedmulti-language input - Brackets auto-completion ★ Contact Us ★Facebook: http://www.facebook.com/typany/ Feedback:[email protected] Click here to download Typany Keyboard forFREE! Rate us ★★★★★ to support if you like our keyboard theme! ★ Notice ★The theme is only available for phones with Typany Keyboardinstalled! Clickherehref to download Typany Keyboard for FREE! ★How to use? ★ -Install the Soccer Spirits Typany Keyboard theme---> Press its icon ---> It would be enabled by TypanyKeyboard automatically! -The keyboard theme will lead you to GooglePlay of Typany Keyboard if you still don't have it in phone.Install and activate the Typany Keyboard to apply the theme! TypanyKeyboard strives to make your typing super easy and fun. ★ AboutTypany Keyboard ★ Typany Keyboard is a free smart keyboard app forAndroid phones. ★Typany Keyboard Features★ - Auto-sync latestpopular words and phrases for accurate prediction - 100+ wonderfulthemes & skins to customize your keyboard; and more colorfulones to come - Vivid emoji & emoticons, stickers compatibleacross popular apps like Facebook, Messenger, Line, Instagram andmore - Emoji predictions - keyboard understands and learns yourfavorite emoji - Customized keyboard layout that suits you the best- Intelligent auto-correction that feels so natural - Wide range ofstickers tailored to diverse cultural regions - Mixedmulti-language input - Brackets auto-completion ★ Contact Us ★Facebook: http://www.facebook.com/typany/ Feedback:[email protected] Click herehref to download Typany Keyboard forFREE! With Mac Keyboard in hand, you can easilyenjoythe clear and professional style on your Androidkeyboard.Mac Keyboard is a new version for Android. It’s free for allusersand it’s quick to download.